While Monday's weather looks quiet, a two-pronged minor snowstorm will impact New Jersey from Tuesday to Wednesday. The best word to describe the forecast for this week? Meh. Yes, it's cold — but this arctic blast isn't nearly as ferocious as the last one. Yes, there's snow in the forecast — but it really looks like a minor winter weather event, with minimal to moderate travel impacts. On this Monday morning, we are waking up to some frigid temperatures. Mostly teens, with some single digits in North Jersey and a few 20s along the Jersey Shore. It will be a quiet, but chilly, weather day with occasional sun and passing clouds. High temperatures will end up near 30 degrees — I wouldn't be surprised to see a few spots in South Jersey slightly above freezing by Monday afternoon. Monday night will be quiet too. Skies will become mostly cloudy, with seasonably chilly low temperatures in the lower to mid 20s. We've been watching our impending winter storm since late last week, with a keen eye toward how a clipper system (from the west) would interact with a coastal system (from the southeast). Bottom line: the clipper is pretty much a sure bet at this point, while the much weaker coastal system seems to be (mostly) a non-issue. This snow event will transpire in two parts. 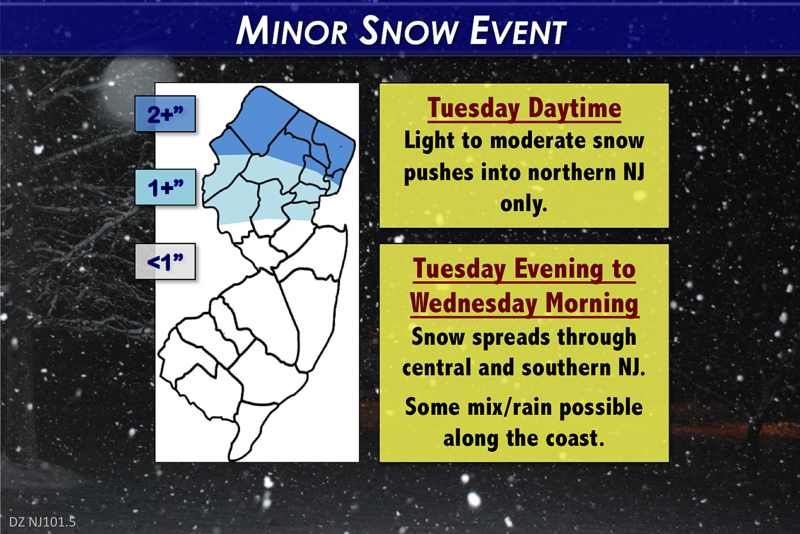 The first phase will be a round of light to moderate snow only for northern New Jersey (generally north of the Raritan River) throughout the day Tuesday. While skies will be mostly cloudy, and I can't rule out a few stray snowflakes, Tuesday's weather will be significantly quieter for central and southern NJ. In the snow zone, high temperatures will hover around the freezing mark. In South Jersey, we might come close to 40 degrees by Tuesday afternoon. Phase two arrives Tuesday evening, as a quick-hitting line of snow sweeps through the entire state. Again, I don't think the snowfall intensity will be incredibly heavy. But it is important to note that the ground is cold enough that snow will begin to accumulate immediately. Even though snow totals will be limited, Wednesday morning's commute might get a bit slippery — that will clearly be the biggest real-life impact from this round of wintry weather. In terms of totals, North Jersey will see the coldest temperatures and the longest period of snowfall — therefore, that's where I expect the highest snow totals. My latest forecast calls for 2 to 3 inches of fresh snow for the area north of Interstate 80. (FYI, I've seen forecast totals here as high as 4 inches.) Expect an inch or two south of that I-80 line to about the Raritan River. For the rest of central and southern New Jersey, a coating to an inch is probable. Frankly, the further south you are, the less snow you're likely to get. The Jersey Shore snow forecast is quite tricky here, with two possible detours from the forecast I've described above. First, temperature may be too warm to sustain all snow, even overnight Tuesday into Wednesday. That means a period of mixing and/or rain will be possible. Second, remember the piece of coastal energy? If that develops closer to the NJ coast, we could end up with enhanced snowfall along the Jersey Shore Wednesday morning. (Obviously leading to higher overall snow totals.) Because the end result of these two possibilities essentially cancel each other out, I've opted to keep the middle-ground "coating to an inch" forecast for the coast. Any precipitation will wrap-up by midday Wednesday, with clearing skies and a brisk wind through Wednesday afternoon. That wind will refresh our arctic air, keeping temperatures just below mid-January normals. Wednesday's high temperatures should end up in the lower to mid 30s or so. I'm keeping Thursday's high temperatures in the mid 30s at best, despite models pushing temps higher. I think that stiff west-northwest breeze will keep thermometers on the cooler side, despite abundant sunshine all day. We'll start trending toward milder temperatures on Friday. Partly sunny skies will accompany high temperatures near 40 degrees on Friday afternoon. That's near-normal for this time of year. And the warmup will hopefully continue into next weekend. Saturday's forecast high temperatures range from the lower to mid 40s. And we could make a run for 50 degrees on Sunday. Our next chance of clouds and showers looks to be the Sunday-Monday timeframe.